I have a variety of interests, hobbies and skills. I have made quilts, bags, boat accessories and many other items. Some of my recent projects are shown below. An interesting reaction occurs on a regular basis when I mention that I have made “fill in the blank” – guys are not supposed to be able to sew or make canvass projects I guess. When I first started to sew a bit, I soon became tired of the practice part of sewing sort of straight lines in fabric. So the first projects were some canvas bags using a purchased pattern. I did not like size of the purchased pattern so I “redesigned” it to a different size. Like the story of Goldilocks, the first one was too small, the second one too big and the third try it was just right, the size that I make the most of today. I found that sizing the bags to hold 6 two liter pop bottles with a little extra room left over was a good balance. That Christmas all my relatives got bags for Christmas, colored to their college colors if I could find them. Nice thing about relatives, or at least mine, the thought still does count, so when some of the bags had wandering stitching issues from my learning curve that was OK. Handmade still counts for something today. Much more interesting to make something useful when learning. Personalized and useful gifts always have a nice touch. A Denim Bag made as a Christmas present, this holds 6 two liter pop bottles with some room left over. 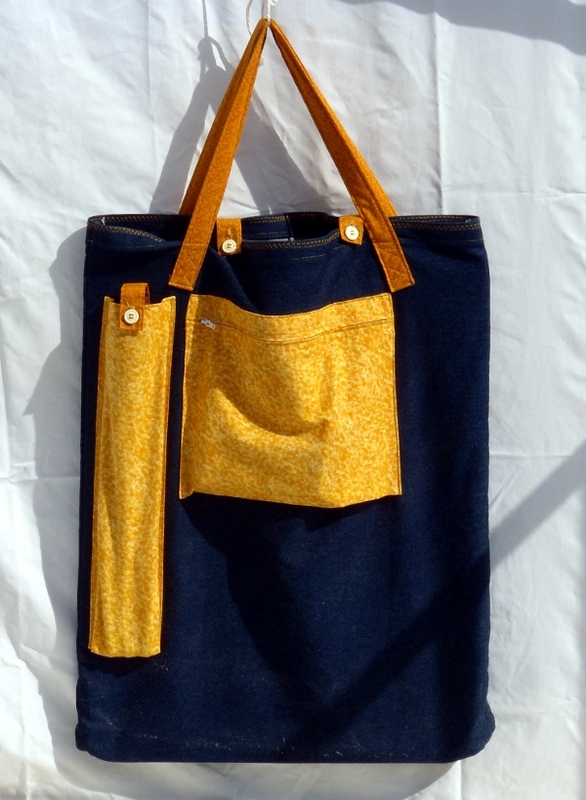 It is made from heavy Denim with natural cotton handles. Folds up nice and small, better than most bags I was told by a friend, and it holds more than the standard Logo Bags you get at the store and more rugged too! 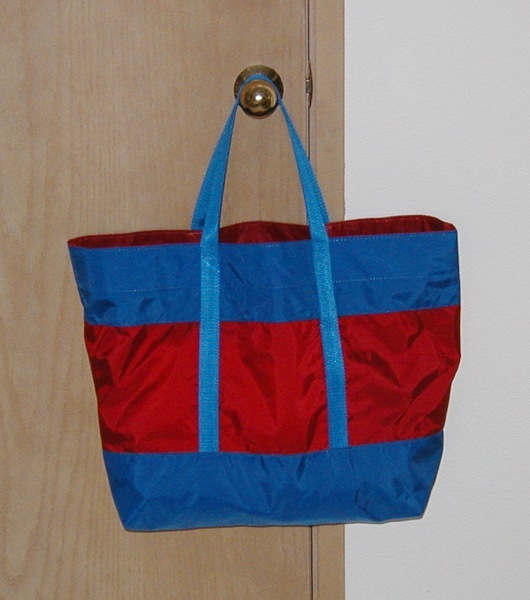 A Red and Blue Birthday present, 430 waterproof Pack Cloth, holds 6 two liter Pop Bottles. 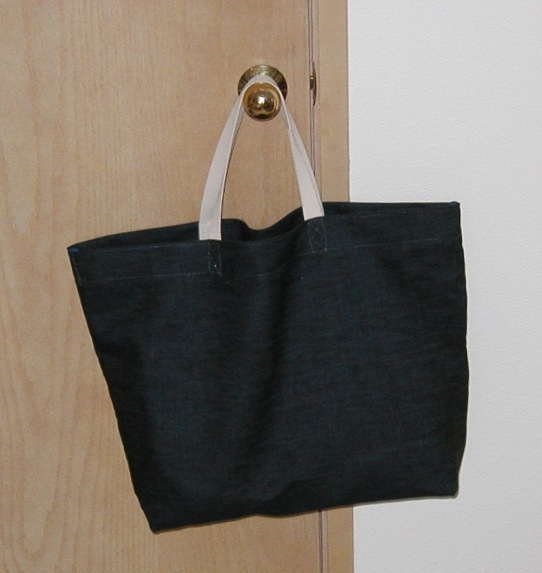 The design was a bit trickier than most bags until I simplified part of it. The upper blue accent area hides multiple layers of fabric to stiffen the top, I also put a rim of Dacron sailcloth inside the upper area for more stiffness to hold the bag open. 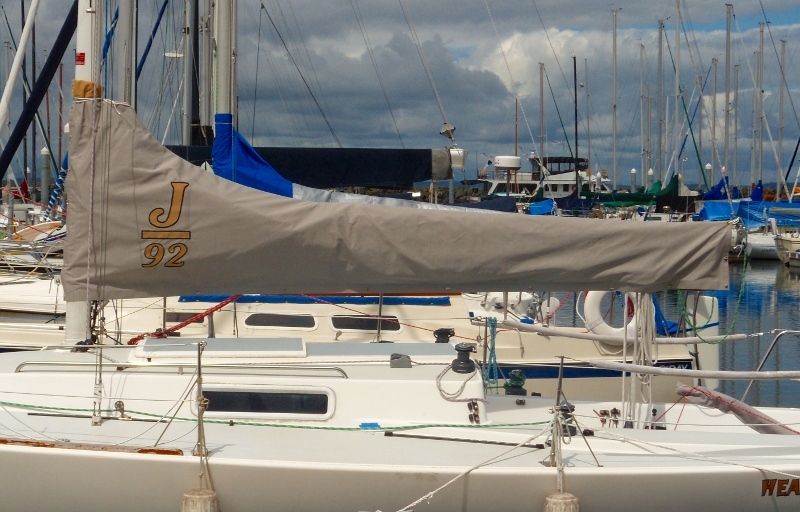 The new Sailcover. The old one was way past prime, I chose Cadet Gray for the new cover, Bronze lettering with a black outline to match the name on the boat. As with many boat projects some blood was shed when the mallet wore a hole in my thumb while punching the holes for the common sense fasteners. Dacron reinforced stress points and top ridge. 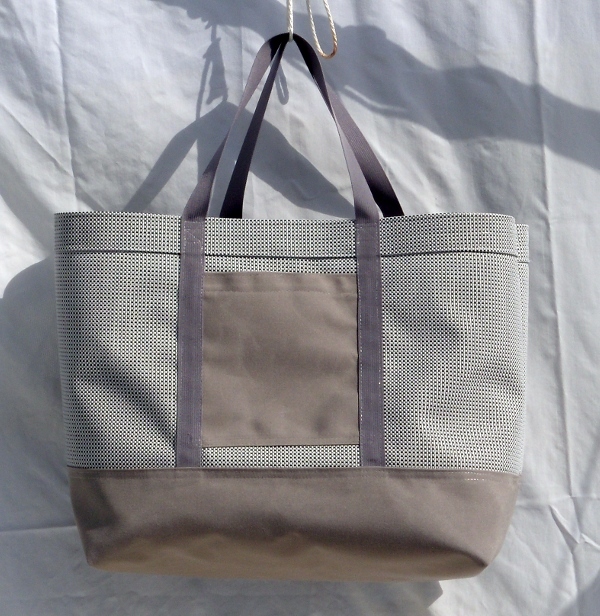 A three color Phifertex weave (white, silver and black) with a Sunbrella bottom and side pockets give this a distinctive look. The Phifertex is a mesh commonly used on sailboats for line and gear bags. The designer Phifertex is heavier than the normal Phifertex used for mesh bags, this made it stiffer and more difficult to work with. 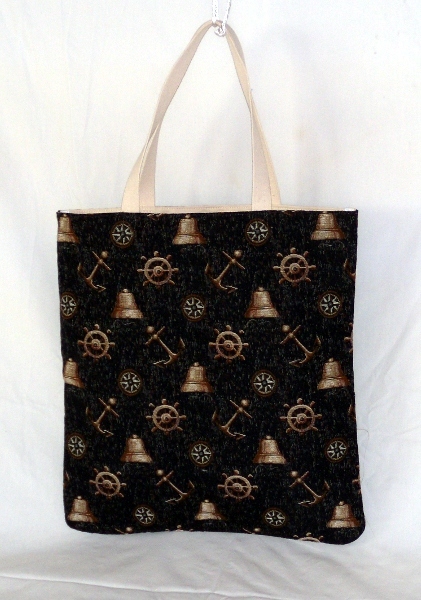 Some nautical theme furniture fabric and presto a bag that advertises you love of boating. 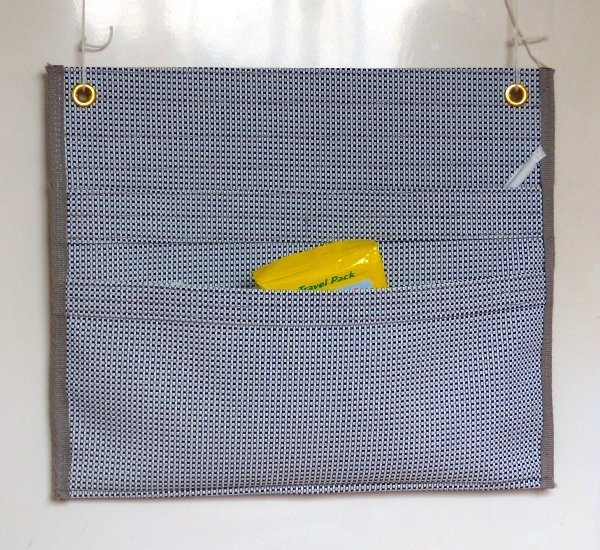 A full canvas liner gives the bag a nice feel. I made some for a charity auction, they were filled with other items so you were bidding on a bag and contents. After the event several people came up with a “did you really make these?” look of bewilderment on their faces. One person liked the bag so much that they had me autograph it. My nieces are finally getting used to Uncle Mike and his sewing presents. About 16 inches wide. This holds spare napkins and hand cleaner wipes. About 12 inches wide. It sits just below a roll of paper towels. When teaching to small groups, having a small White Board is nice. This is a carrier for a 16 x 22 inch board. The pockets hold a small tripod to hold the board up on the table and the larger pocket holds the wipe off markers and eraser. Thanks for the interest in some of my other projects.